The Florida Bar Disciplinary Review Committee (DRC) oversees the prosecution and appeals for disciplinary violations by Florida lawyers. When a client, opposing counsel, or judge files a complaint against an attorney, it goes through a preliminary investigation, geological branch investigation, and then is sent to a grievance committee to determine probable cause. The DRC oversees this process and committee board members review each case before it is sent to the Florida Supreme Court, making recommendations on disciplinary action, dismissal, or requesting additional review. Additionally, members of the DRC recommend policy lawyer regulation and other disciplinary matters. What does the average Florida lawyer need to know to avoid this process? 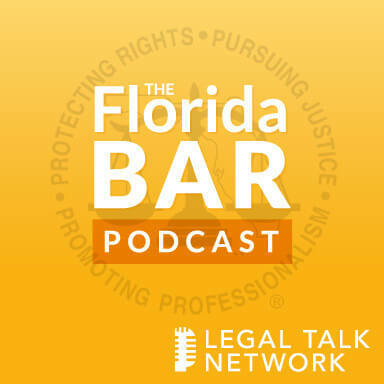 In this episode of The Florida Bar Podcast, Adriana Linares interviews Adria Quintela, Florida Bar director of lawyer regulation, and Michelle Suskauer, chairperson of the Disciplinary Review Committee, about trends in the way the Florida Supreme Court is treating disciplinary actions, the top issues causing lawyers to receive complaints, and the proper course of action within the grievance process. Adria discusses the Florida Bar’s process in dealing with complaints and explains that the largest problems come from a lack of client-lawyer communication. Most complaints could be avoided, she explains, by picking up the phone or sending an email. Michelle discusses the Supreme Court’s decreased tolerance for unprofessional behavior and how it might relate to technology, social media, and far-reaching media attention. She has noticed that lawyers receive complaints due to disorganization and missing deadlines. Florida lawyers should note that these issues are avoidable and, for the most part, unintentional, but will end up on a permanent record. Michelle Suskauer, is a West Palm Beach criminal lawyer, serves on The Florida Bar Board of Governors, 15th Judicial Circuit, and is chairperson of the Disciplinary Review Committee. She is also a nationally known legal analyst who has made hundreds of television and radio appearances. Her leadership roles include past president of the Palm Beach County Bar Association, vice president of the Board of Directors of the Legal Aid Society of Palm Beach County, and past president of the Florida Association for Women Lawyers, Palm Beach County Chapter. Adria Quintela is staff counsel and director of Lawyer Regulation for The Florida Bar. She supervises the operations of the entire Lawyer Regulation Department of The Florida Bar, including direct supervision of the Chief Branch Discipline Counsel in each of the five branch offices of the department. She has been with the Florida Bar for 19 years, but previously handled commercial litigation for a Miami law firm and was a plaintiff’s trial attorney for Krupnick & Campbell, a Ft. Lauderdale law firm. Adriana Linares: Hello and welcome to the official Florida Bar Podcast brought to you by the Practice Resource Institute on Legal Talk Network. The Practice Resource Institute is the Florida Bar’s online center for practice management information, dedicated to Florida attorneys. I’m Adriana Linares, and I’m your host. I’m a legal technology consultant and trainer, I’ve been working in and around Florida for many, many years helping lawyers with their technology questions, issues, and I’m very honored to get to be your host. Today we have a very cool episode, I think. We’re going to be talking to Michelle Suskauer and Adria Quintela. Adria works for the Bar, directly, Michelle is on the Board of Governors, and together they work on the Disciplinary Review Committee. So we’re going to ask them a couple of questions and we’re going to start off by saying hi Adria, thank you so much for taking the time to join us on the podcast today. Adria Quintela: Hello, thank you very much for having me, it’s a pleasure to be here. And I am the director of Lawyer Regulation for the Florida Bar, I’m also staff counsel. And what that basically means is that I oversee the functioning and the case processing of our 5 branch offices. We have offices throughout the state, and each of those offices is responsible for overseeing whether or not there’s any potential misconduct of any of its Bar members. And I have been in this position now for nineteen years. Adriana Linares: Wow, that’s a long time. I bet you have seen a lot of interesting things over those nineteen years working for the Bar in that role. Adria Quintela: Yes, we have seen everything, and some of those things we have seen could probably make great reality movies. Nobody would believe them unless you’ve lived them. Adriana Linares: Oh, I bet. And hey there, Michelle? Michelle Suskauer: Hi, how are we doing? Adriana Linares: Oh, great, thank you so much. I know how busy you both are, I really appreciate it. Michelle, why don’t you tell us a little bit about yourself and what you do outside the Board of Governors? Michelle Suskauer: I’ve been a criminal defense attorney for 24 years, practicing just criminal defense with my husband who’s my law partner, so that makes for interesting pillow talk. And we practice in West Palm Beach and basically all over Florida. And I’m a mother of two, and besides all of the fun stuff and running into court and helping people negotiate through the criminal justice system, I’m a legal analyst for NBC and Fox and CNN, so I get to go on TV and be one of those talking heads giving my opinion over a variety of legal stories on the news that people are interested in, so that’s a fun part of what I do. And being on the Board of Governors, I’ve just finished – I believe – my fifth year on the Board of Governors, and I’m lucky enough and fortunate to be chair of the Disciplinary Review Committee. So I get to work with Adria and being our staff member on the Disciplinary Review Committee is certainly only one small thing that Adria Quintela does for the Bar. But it’s really just been a pleasure working with her over this past year and we’re going to be working together again next year as well. What the Disciplinary Review Committee does, the DRC, is we’re made up of members of the Board of Governors, and we look at and we oversee the prosecution and appeals for disciplinary violations by Florida lawyers. We recommend policy on lawyer regulation and disciplinary matters, we make recommendations on different disciplinary actions, and we decide if something should be reviewed and appeals or what direction we want to go with certain particular cases. And so it’s certainly very interesting, I think it’s incredibly important, one of probably the most important committees that we have on the Board of Governors, and I think certainly, the most important thing we do as far. Adriana Linares: So walk me through the steps of what happens when a violation is brought to your attention and sort of the step by step of how it gets to Adria and how you get involved. Michelle, why don’t we start with Adria and you tell us; I imagine that it goes to the Bar first. So at some point, does it get to you and then it trickles up? Adria Quintela: Yes. What ends up happening is we have a centralized intake system in Tallahassee, and that’s sort of the birthplace of complaints. So anyone who files a complaint against an attorney, files a complaint in Tallahassee and in essence gets farmed out to the different branches, depending on where the attorney is located geographically. So if the attorney is located in West Palm Beach, for example, that’s going to go to our Fort Lauderdale branch that oversees that geographic area. The complaint gets reviewed by one of our Bar counsel in our office. Each of our branches have between 5 and 6 full-time attorneys that are dedicated to just reviewing and processing complaints and also being trial counsel. They basically handle caseloads from the very beginning, through trial, through appeal. So they do it all, they’re trial counsel and appellate counsel. When the case ultimately goes, if it goes through trial, and many complaints are actually closed without any discipline, so they would never get to the Disciplinary Review Committee and to me and Michelle. And I want to echo that it is a pleasure to work with Michelle, because we actually, in each of our meetings, we have six meetings each year. And in each of those meetings, we review a tremendous volume of cases. Probably at a minimum, we have 25-40 discipline cases that we review in each of those meetings. And each of those consist of hundreds and hundreds of materials that the committee goes through. The Disciplinary Review Committee is the largest committee on the Board of Governors, so it’s a huge body and it’s a very important body of work that gets done in that committee. The cases that go to that committee are the cases where the Bar has decided to prosecute the attorney for the most part. So it comes to Michelle and I via the fact that there’s been a trial and the committee needs to review the determination by that judge as to what discipline is appropriate. And the function of the committee is to basically tell the Bar whether we should be appealing that finding because we don’t feel it’s an appropriate finding, we need to go higher and seek review by the Supreme Court of Florida, or we are fine with the finding and we do not want to appeal. So the function of DRC is to take all of those cases that have come from all of the branches from the state that the Florida Bar has looked at and tried or settled, in some cases, and be an overview and a body that determines what, if anything else, should happen to that lawyer. So it’s extremely important work and the cases that are there are the cases that end up going to the Supreme Court of Florida for their ultimate review and determination. Michelle Suskauer: Regardless of what we do, the Supreme Court is the final arbiter. And I may have the say of what, if they’re going to approve our recommendation, if they’re going to send it back. And we’ve found – and I’m sure, Adria, that you’re going to agree with me – that the Supreme Court has gotten much, much tougher on attorney discipline over the last several years in terms of what justice they’re meeting out, what they agree with and what they don’t. Adria Quintela: Absolutely. The Supreme Court has made it very clear in its recent opinions that they are taking a tougher stand on lawyer discipline, and that any amount of misconduct is not going to be tolerated. And we, the Bar, have seen a trend in the past four to five years of increased discipline, even when the Bar and DRC have not decided to seek a higher sanction. The court on its own has imposed a higher discipline, so we have seen that trend. Adriana Linares: Wow, that’s really interesting. And have you identified a reason, a cause, some sort of shift in the way lawyers are either working or practicing or advising or communicating that you feel there’s been this sort of heavier foot come down? Michelle Suskauer: I think there’s very little tolerance for unprofessional behavior. You can see it also in the way the Supreme Court handles judges that are acting unprofessionally or acting out in terms of what they are doing with judicial qualification commission’s complaints as well. And I totally agree with Adria, I mean it seems that this is the way that the court has been going in terms of a very stiff stance. Adriana Linares: I’m always thinking about technology and the way it’s affected our profession but every profession. I wonder if there’s that sort of either fear or interest of it’s easier to find out what’s going on, what people have been doing. Maybe things, violations or issues were easier to sort of keep quiet. And now when something goes wrong, it goes wrong and the whole world can hear about it. So maybe there’s some that intolerance is just more of the knowledge that it’s easier for people to be talking about Florida lawyers or through social media and all that stuff. Because I know I can’t stand it when just over the past two weeks, there have been reports – one out of Orlando and one out of Tampa – of attorneys who had thrown a bunch of client files into the dumpster. And regular, literally passerbyers, who happen to be dumping. So now all of a sudden, this thing that maybe wasn’t going to get out there is just out there and it was all over Twitter and social media about these two Florida law firms. And it’s not that it’s just happening in Florida, it’s happening everywhere, of course, but now it’s just that idea that no matter what you do, even something quote “small” could become so big. Michelle Suskauer: I would agree with that. Adriana Linares: Oh, would you? Adria Quintela: There’s a lot more awareness, absolutely. There’s a lot more awareness at all levels of potential misconduct because we all read about it in social media, we see it, we hear about it, so there’s a lot more dissemination of information. And even in communities where if something occurred in one community may not be heard of in the neighboring community, now that’s not true. Now it’s everywhere. So I think that awareness has certainly brought everybody more up to being aware that this is happening and reporting misconduct too, which is what we’re seeing from the Bar’s perspective. We’re getting complaints from somebody in Gainesville can report misconduct on somebody from Miami, and they hear about it, a case that they would otherwise have not heard about. Michelle Suskauer: And further to that, not only listening and learning about lawyer misconduct, but the public is looking at what is the Bar doing about this lawyer misconduct. And so that perception is important and there have been big cases where people are taking a very hard look at what is the Bar’s response, what is the Supreme court’s response to that type of misconduct and I think people are very aware of that. Adriana Linares: I definitely can see that and it’s just that we’re protecting the citizens, we’re protecting the lawyers, we’re protecting ourselves, and I think that’s a really interesting shift in how again this whole process is just changed a little bit. But I like to hear that the courts are coming down harder, because maybe that will make any lawyer who’s about to do something on purpose, or what I’m about to ask you in the next segment is maybe bringing more attention to the types of violations or complaints that they don’t even realize or are possibly doing and maybe it’s just going to make us think about it a little bit more if we’re talking about it a little bit more and hearing about harder sorts of actions being taken against these lawyers. Adria Quintela: Well certainly if folks would read about what is going to happen to lawyers as a result of certain conduct, it could act – and we hope it will act – as a deterrent to others to act appropriately. Well before we move onto our next segment we’re going to take a quick break to hear a message from our sponsors. Adriana Linares: Welcome back to the official Florida Bar Podcast. I’m Adriana Linares and with me today are Adria Quintela and Michelle Suskauer. Adria, I have a hard time with your name because I kind of want to finish it with my name, so I keep having to stop myself. So before the break, we were just talking in general about disciplinary actions and what we’re seeing happening as far as the court coming down a bit harder. What are the types of top issues that we’re seeing this day and age coming down the pipe for you guys? Adria Quintela: I think the issue has been what I have always seen in my 19 years at the Florida Bar and continues to be the primary issue is communication. The one area that the Bar receives the most complaints about is lack of communication between client and lawyer. And I can’t tell you how many of these complaints may have been avoided, had there been a simple phone call, a simple letter of the lawyer reaching out to the client. What most clients find most frustrating and what they contact about is all they really want is information about the case. They want to know where their case is going, whether their legal matter is progressing or not, and they want answers to what is a complicated and unfamiliar process to them. And that’s the reason they hire a lawyer to begin with. And when they don’t get a response from their lawyer, they become increasingly frustrated, and they have nowhere else to turn other than sometimes the grievance system to get answers to questions. So when we established our attorney-consumer assistance program – which is housed in Tallahassee which served as our intake program – one of the purposes of that program was to hopefully avoid lawyers from becoming part of the grievance process and moving on to the system and having their file move on to the different branch offices and potentially, ultimately, Michelle and I at DRC. So a lot of the complaints that come in there is a simple lack of communications. Our lawyers will reach out to that lawyer and hopefully have them respond to the client so that they get their answer and they don’t continue on in the system and file that complaint against them. So that’s one of the key areas we continue to see where lawyers could certainly improve on. Everybody’s busy, sometimes because the natures of practice, people are in court all day and they can’t return phone calls or they’re in a trial or they’re unavailable for whatever reason. But what we always tell lawyers when we go – and I speak around the state and I talk to people – is just return a phone call. It takes one second to call, it’s so easy. Just call them back and say there’s nothing happening in your case, but here is what I’ve done. That can avoid so many complaints, and it usually does, but if you don’t take the time to spend those 2 minutes with that client, you can spend a lot longer responding to a Bar complaint. Michelle Suskauer: Another issue that I see is lawyers who are completely disorganized. They are missing deadlines, they are not just missing phone calls, but and that leads to their frustration, it could lead to more unprofessional conduct. Missing major deadlines can obviously cause great harm to the client and then ultimately land you with a grievance. And that’s something that I think can be fixed with technology, and probably very easily. Adriana Linares: Of course, that’s what I say! But I have to say, I am so relieved. Actually I’m kind of having as much anxiety as I am relief over this conversation because I thought they’re going to come on and say that lawyers are doing all this nefarious on purpose doing things wrong. Of course, as much time as I spend in law firms, I know that’s not actually true, but I thought there’s going to be this level that I don’t know about this whole world. But the truth is that I’m very relieved to hear that those are the biggest complaints you get. Because you’re both right. From a technology perspective, those have to be the easiest issues to prevent, avoid, and mitigate risk with by using technology. Especially today. There is no great opportunity in finding technology to help you manage your matter load and your communication with clients than today. I mean it’s just unbelievable. So if you have a couple of words of wisdom – and let’s start with Michelle, as far as using technology. And I’m definitely going to start with Michelle because you’ve been involved with Vision 2016. Michelle, you know how the Bar has been focusing very hard lately on helping lawyers understand technology better and we’re going to keep moving in that direction. What types of advice are you giving these lawyers that you’re talking to across the state and especially as a member of the Disciplinary Review Committee. How do you reduce those issues? Wouldn’t it be great if you guys didn’t have so many of those? Adriana Linares: And even a lot of these case management programs today, which we have several now new member benefits through the Florida Bar that are products like Clio, RocketMatter, MyCase and Amicus. Those practice management and case management programs make it easier and it’s almost inexcusable, really, for lawyers not to have tools like this that they’re using this day and age. They make it easier for you to manage that information, to get organized, to communicate with your clients, to be reminded of dates and deadlines. It really is to me almost inexcusable that these are the main types of issues that you’re seeing. Michelle Suskauer: But I think the problem is there are folks that – first of all – either don’t know about these tools that they can very easily acquire and learn about, or are scared of them. They are not technologically competent, they don’t know exactly what to do and how it will truly make their practice much more efficient and also keep them out of the grievance system. So I think there’s a lack of understand and there’s a lack of knowledge and competency. Adria Quintela: There’s resistance to technology by some members of the Bar but in reality, I think everyone – or just about everyone – has a cell phone. And as basic as it is to just pick up a cell phone, text a client, those things could be done. And you’re absolutely right that those are very simple things to do. And I think the programs that are available now, you’re absolutely right. They make it so easy for a lawyer to communicate with a client. It’s almost generating communication for you nowadays, all you’ve got to do is basically send it out and fill in some blanks. And I think that would solve so many of the problems. And I think what we need to focus on is it’s not only the technology, but it’s the fact that even if it’s there, you have to use it and you have to be willing to use it. Because a lot of the lawyers that we get complaints about, they have case management programs, they have the technology available. They have the resources but they’re still missing that basic concept of I have to do something. I have to do something and I have to respond to that client, and it is just a total sort of putting on the blinders of everything will be fine and I don’t have to do anything and I don’t have to call the client back, and it’s not. And then the funny thing is is then when they get the complaint, they become extremely responsive. But by then, it’s late. Adriana Linares: Right. And it’s true, you’re right, there are probably plenty of lawyers and law firms who do have those tools in place but they’re not using them, they don’t know how to use them, or like you said, they just flat out don’t want to use them as a way to prevent some of these issues. I think it’s very, very interesting that those are kind of the main issues that are being sent up the chain to the Florida Bar. It just seems like something within a year or two we could just so easily come together as one and reduce the number of claims that are made in the communications and administrative field. It’s very, very interesting. Well, any closing thoughts from you Adria? If you could say one thing to every single lawyer in Florida – because I’m sure every single lawyer in Florida is going to download and listen to this episode – that would make your life and just the Bar’s life a little bit easier as far as dealing with stuff that you wish you didn’t have to deal with. What would that tip or thing be? Adria Quintela: If I could say two things, I would say number one, if you want to avoid being part of the grievance process at all, just talk to your client. I think most complaints would be completely eliminated if the lawyer took a few minutes to talk to the client. But if you find yourself in the grievance system, the most helpful piece of advice I would definitely give them is be responsive to Bar counsel. If you have a complaint, tell the truth. Admit to whatever mistakes you’ve made along the way and just own up to it and that’s going to go a long way towards getting a more favorable disposition than those cases where the lawyers don’t respond, deny, and blame the client. So just be honest is really the best piece of advice that I could give somebody that finds themselves already in the system. Adriana Linares: That’s great advice, both of those. Michelle, what about you, what do you have to say? Michelle Suskauer: Well, communication and if you are unsure about something, pick up the phone and ask. Ask a lawyer that you trust, someone older, call your local voluntary Bar association, or call up the ethics hotline for the Florida Bar. And I’ll tell you, there’s a wealth of information that’s available on the Florida Bar website, and all you have to do is look. You can learn all about the grievance system, you can learn about the Practice Resource Institute, you could learn about our partners on the website. And I think that we should stress that there’s a lot of information that they can learn to make their practice easier and to avoid being involved in the grievance system. Adriana Linares: Well thank you so much Adria and Michelle. Adria, if people want to either keep an eye on what the DRC is doing or get more information about the grievance committee, the kinds of disciplines that are possible and all of that, I’m assuming that just like Michelle said ,the best thing to do for them is to visit the Florida Bar website? Adria Quintela: They can either call their local branch offices, so if they want to reach out to a local branch office in whatever geographical area they are located in, we will pick up the phone and we’ll do everything we can to help them. If they’d like to get involved in the grievance committee or they go to the webpage and can’t find an answer to a question, all of the branches are set up to help individuals who have whatever question and we will do our best to help them and to guide them to get the answers that they need. Adriana Linares: That’s excellent, thank you so much. And Michelle, if someone out there wants to keep an eye on what you’re doing as far as Twitter and Facebook and all of that, how can they reach you? Michelle Suskauer: Well, they can go on my website and you can contact me at the SuskauerLaw.com. My Twitter handle is CriminalDfense, and on Facebook you can find me at Michelle Suskauer on my fan page, and I would love to answer any questions or they can see what I’m up to. Adriana Linares: Thank you so much. I can’t tell you both how much I appreciate your time. I think this is an incredibly important and helpful topic and probably one of those that a lot of lawyers don’t think about that I’m sure they’re going to find it very interesting. And hopefully they won’t have to come across the two of you at a DRC meeting because I’ve seen those and I tell any lawyer I can, you do not want to have to go in front of the Board of Governors and get your hands slapped. That is just a terrible experience. Michelle Suskauer: It is, and it becomes part of your permanent disciplinary record, so you just don’t want to be there. Adriana Linares: Yes, and I agree, so let’s start to see a drop in complaints and issues as soon as possible. Well that brings us to the end of our show and I’m Adriana Linares. I want to remind you that you can of course keep an eye on the Legal Talk Network on iTunes, RSS, Twitter, Facebook and of course the website. Thank you for listening and make sure to join us next time for another great episode of the official Florida Bar Podcast.